Now we know the iOS faithful love their iPhone 4 but to what expense would the ioS faithful go to protect the iPhone 4? 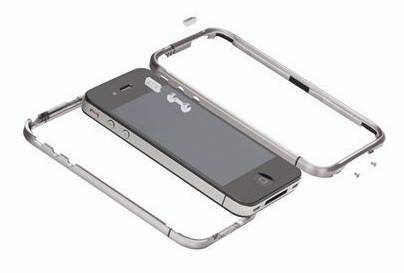 It appears that cases for the hugely popular Apple smartphone can at times be quite expensive, although there are cheaper options out there, but would you hand over 300 bucks for an iPhone 4 case? The case in question is the iPhone 4 Titanium Premium case from Case-Mate, and is brought to our attention by the guys over at Ubergizmo and by way of Chip Chick, and this iPhone 4 accessory even tops the price of the Louis Vuitton cases we reported on recently. Apparently for your $300 you’ll also get a tool kit for putting the ting together by screwing the case onto your iPhone 4 with tiny screws and a mini screwdriver, seems like if you are going to shell out 300 of your hard earned dollars you could at least expect not to have to assemble the case yourself, but there you go.